The only reason why I have created a page specially for this is because it reinforces my faith that Singapore DOES NOT need to import foreign talent in order to produce world-class athletes. – Our local athletes are too soft, too kiasu or have just too many options to have the heart of steel needed to undergo the sort of gruelling training needed to become full-time athletes. To this I say rubbish – if the National Sports Association cannot convince the athletes to work hard, to look at professional sports as a possible career path, then maybe it is the fault of the NSA, not the athletes, for not being able to persuade them. – We need a mix of foreign and local talent in order to suceed in sports. To this I say, perhaps there’s some truth to it, but if you look at the success that sailing and bowling have tasted over the years using just local talent, then you also know that you can succeed with local talent if you put the proper support structures and developmental programmes in place. DO NOT be taken in whenever you hear or read about our foreign talents winning glory for Singapore, or hear about NSAs or the sports authorities waxing lyrical about how these foreign talents have spurred us on to greater heights. Just come back to this page and read over – and over – again how two national sports associations are doing it WITHOUT resorting to foreign help. The people running these NSAs – SingaporeSailing and the Singapore Bowling Federation – are the true champions of Singapore sport. They deserve our every support and respect. A number of national sports associations have groomed local sportsmen to world standards. Others who once looked abroad now nurture locals, with success. Senior Writer Yap Koon Hong reports. A KEY concern Mr Low Teo Ping and his fellow volunteers addressed seven years ago when they decided to build a pipeline to produce world-class sailors was the question of talent. Should SingaporeSailing, the national association which he had just taken over as president, recruit foreign talent? No, they decided. While they would seek the best foreign experts to help build a world-class structure, the sailors must remain local. ‘We were criticised then but we stuck to our belief,’ says Mr Low, who is leading Singapore’s contingent to the forthcoming biennial South-east Asia Games in Thailand from Dec 6 to 15. 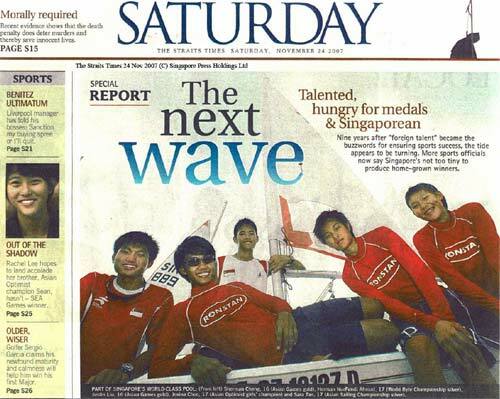 SingaporeSailing’s decision was significant then because major sports such as table tennis, football, athletics and badminton were recruiting foreign-born talent to help Singapore win medals. The groundwork was laid in 1993 when the government introduced the foreign sports talent (FST) scheme but the rush to recruit accelerated some nine years ago. The rationale was that Singapore had to recruit talented foreign athletes and offer them citizenship largely because its tiny population was inadequate and competitive sport had evolved into a full-time pursuit. Besides, it was argued, it would be foolish not to exploit the convenient availability of quality talent abroad in an interconnected world. But the Singapore Bowling Federation, like SingaporeSailing, thought otherwise. ‘Foreign talent is the easy way out and I have never believed in that,’ says Mrs Jessie Phua, who has been the association’s president for thepast five years. She has been actively involved with it for almost 20 years and is a Nominated Member of Parliament. In August, she became the first Singaporean, and woman, to be elected president of the sport’s world governing body. ‘Sometimes, the harder way is the better way because you reap a genuine harvest regularly,’ she says. After almost a decade of the foreign talent scheme, the harder way appears to be gaining ground. Athletics and swimming are building talent pipelines that emphasise the scouting and grooming of Singaporean-born athletes while niche sports such as cricket are sowing the seeds of a local talent pool in schools. ‘We do not need to intentionally woo foreign talent because we have some of the best youngsters who are comparable to the best in the same age group in other top cricket countries,’ says lawyer Mahmood Gaznavi, deputy president of the Singapore Cricket Association. For some sports, international pressure is another reason to focus on local talent. Key world governing bodies are virtually treating citizenship-switching as cheating; an act that is as disagreeable as athletes inflating their performances through steroids. These international bodies worry that wooing foreign talent is a quick fix that will weaken the will of less successful countries to develop a viable local talent scheme which is costlier, harder to construct and takes longer to mature. The International Amateur Athletics Federation, which governs track and field competitions, recently imposed an indirect penalty against countries which lure top foreign athletes. The penalty, encoded in the rule called the Switch of Allegiance, bars an athlete from representing his or her new country for three years after obtaining citizenship. Given a track and field athlete’s average peak life span of five to 15 years, the rule may not be as significant a disincentive as its most ardent proponents would have liked. Germany, for one, argued for a five-year ban. But it does make countries bent on medal-winning quickies think twice. Fifa, which governs the world’s most popular sport, soccer, has a stricter rule and wants to impose more measures. It has long restricted a player to representing only one country in his lifetime. Now, it is pushing for a cap on the number of foreign players in professional clubs. A second reason for the trend in Singapore towards bulking up on local talent is a change of leadership in some associations. Newly elected officials, some of whom are former national athletes who navigated the Singapore system successfully, are challenging entrenched paradigms. The latter underscore the view that Singaporeans cannot excel because of obstacles such as a lack of strength and physique, a small population, an unfriendly education system and national service. Mr Oon Jin Teik, chief executive officer of the Singapore Sports Council, says that while these concerns may be unique to Singapore, all countries have their problems. ‘O- and A-level exams and national service are predictable humps around which national associations, athletes and coaches must master plan,’ he says. Sometimes, going through the humps prepares an athlete better, he argues. ‘Elsewhere, there are athletes who take two years off to go on a church mission, return to their sport and go on to become world-class athletes,’ he says. Mr Oon, who studied chemical engineering on a swimming scholarship at an American university, was a member of the golden generation of Singaporean swimmers in the 1980s who included Asian Games gold medallists Ang Peng Siong, David Lim and Mr Oon’s brother, Jin Gee. For example, swimmers are better prepared now at qualifying for international competitions on merit, rather than on appeal, he says. He believes a new plan by the association will help local swimmers win at a level higher than the SEA Games. A third reason is that the foreign experts are reinforcing the view that Singapore can succeed only with a sound talent base of largely Singapore-born or bred athletes. While they agree foreign talent shouldn’t be discouraged, there is no need to source them systematically. ‘You cannot win by depending on a Tao Li alone,’ says Mr Wen Xin Long, 58, who was hired recently as the swimming association’s director for high performance. A former coach of China’s Olympic swim team, he has coached in Singapore for the past 13 years. Teenager Tao Li, who was born in China, won a gold medal at last December’s Asian Games, the first female Singaporean swimmer to do so in almost 30 years. Because it is impractical to create a talent pool that depends on someone like Tao Li, Mr Wen recommends rebuilding the structure to keep local talent swimming competitively. Even sports that rely on an active foreign talent pipeline are working harder to nurture local talent. Table tennis and badminton say they have a fresh pool of local players who are younger and better trained to compete internationally. Soccer, which raised the temperature of the debate over inducting foreign sports talent when it started its scheme seven years ago, is enjoying a winning run because its scheme in developing local youth is blossoming. Of the 45 players registered for the 2010 World Cup qualifying rounds, only six are foreign talent, says the Football Association of Singapore (FAS). One reason for the low number? ‘The early success of our local youth development programme,’ says FAS secretary-general Steven Yeo. Early this week, Singapore reached the third qualifying round for the World Cup for the first time. Nine players in the team graduated from the programme. Even so, there is a clear divide in the talent stakes between sailing and bowling on the one hand, and table tennis and badminton on the other. It is evident in their respective elite pool of athletes and policies. Singapore’s $7 million sports scheme to fund a select group of full-time athletes in a bid to win an Olympic medal within the next two Olympics in Beijing next year and in London in 2012 includes table tennis and badminton players as well as sailors. The four shuttlers and two table tennis players in the scheme called Project 0812 are foreign-talent citizens whereas all the 12 sailors are native Singaporeans. Table tennis and badminton believe that foreign talent is indispensable to achieve their goals. For instance, the Singapore Badminton Association’s (SBA) prime target is to qualify for the final rounds of the sport’s symbol of world supremacy, the Thomas Cup, in 2012. The SBA reckons that half the talent who will help Singapore get there are likely to comprise foreigners who are given citizenship. The Singapore Table Tennis Association (STTA), which recruited the first foreigners to play for Singapore in 1996, says it will keep sourcing foreign talent because of Singapore’s small population. ‘We see no reason to impose this restraint on ourselves as we are living in a very open and connected global village,’ says STTA president Choo Wee Khiang. Foreign-talent citizens also inspire and attract youngsters, he adds. Indeed, the Singaporeans who have come closest to winning an Olympic medal in 47 years are foreign-born talent such as retired star Jing Junhong and her successor Li Jiawei. Tan Howe Liang won Singapore’s only Olympic medal when he finished second in weightlifting at the 1960 Rome Olympics. Jing finished fourth in the women’s singles at Sydney 2000, as did Li in Athens four years later. ‘To continue to entertain any sense of distinction between local-born and foreign talent is not helpful in our national agenda to engage and encourage the best talent from around the world in all fields and industry to make Singapore their new home country,’ says Mr Choo. The leaders of sailing and bowling however believe that Singapore does not need to supplement its local pool. ‘Firstly, we believed that our local talent could do it,’ says sailing’s Mr Low, recalling his association’s decision seven years ago. ‘Lack of a sizeable physique didn’t necessarily disadvantage us because winning in sailing is as much about tactics as it is about strength. ‘Second, if we were going to volunteer blood, sweat and tears in such a long-term project, should we do it to benefit foreigners or our fellow Singaporeans? The bowling federation agrees. ‘If other sports believe in foreign talent, that’s their call,’ says Mrs Phua. Five years after SingaporeSailing restructured, a fresh crop of sailors started winning, beginning with an unprecedented world championship for youth in 2005, a competition second only to the Olympics. They followed that up by finishing first in the gold medal standings for sailing at the SEA Games later that year and first again at a harder level, the Asian Games last December. The Asian Games feat was important because it confirmed that the local talent pool could produce champions consistently. Bowling has taken its policy a step further. The federation used to hire a foreigner as head coach. Now, that job is being shared by three local coaches and the entire coaching staff are Singaporeans. ‘The days of the Superman coach having to be a blue-eyed blond who can make it happen for us are gone,’ declares Mrs Phua. THE first problem Mr Andrew Sanders realised he had to solve was the parochial attitude of Singapore‘s sailors and coaches. A government geologist by profession and a former Australian sailing champion, he was hired by SingaporeSailing to set up a centre to develop elite local sailors. ‘It was a culture shock,’ said Mr Sanders, 38, recalling what he saw when he took the job here five years ago. ‘The sailors didn’t care about the rest of the world or about each other,’ he said. So his first task was to teach them that to win, sailors had to share knowledge, not keep it from each other. ‘After several lectures, they realised that if they worked together, they could be No. 1 and No. 2, rather than at the bottom,’ he said. It helped that his first group were teenagers, whom he took for training and competitions in Australia. ‘I showed them how the Australian sailors, who were some of the world’s best, shared information willingly because that was how they stayed ahead of the rest,’ he said. Then, the Singapore sailors experienced a culture shock. During breaks between sparring with the Australians before competition, the Singaporeans were astonished when their rivals gave them tips. ‘They thought it was a trick because these were the same Aussies they would be competing against after the sparring sessions,’ he said. But they realised that sharing information was how sailors improve. World champion Victoria Chan, 17, says that sharing information with rivals is now common practice. ‘We are good at sailing in light winds because of the conditions in Singapore and our training partners in Holland or Australia know more about rough-weather sailing,’ she said. Victoria is one of 12 sailors in a current programme for a select group of athletes aiming to qualify and win an Olympic medal in Beijing next year or London in 2012. Mr Sanders, promoted to the post of SingaporeSailing’s chief executive officer this year, said the association’s talent programme was an amorphous mass before it was restructured. It provided coaching, but other key elements necessary for grooming and retaining talent were missing. ‘We had to develop aspects like balancing sport and education and realising that it’s not one or the other but both, and that both help each other,’ he said. Said SingaporeSailing president Low Teo Ping: ‘The first thing we tell our national sailors is that you cannot be a professional sailor. It is not a full-time job because it’s impractical. His son Wen Chun, 17, who is representing Singapore at the SEA Games next month, knows it, too. ‘All I wanted to do was sail and because of that my studies suffered,’ said the former Raffles Institution student. He had to buckle down last year to make the grade to move on to Raffles Junior College. Mr Sanders said that previously, proper nutrition, building physical strength and conditioning were not monitored. ‘The standard then was such that you could be a bit lazy and physically unfit, and still win if you were smart tactically,’ he said. The sailors were quite cavalier about their diet. ‘They were eating char kway teow, potato chips and ice cream which I told them they couldn’t and they wouldn’t listen,’ he recalled. Right nutrition and right training helped that batch improve radically and sparked a chain reaction. ‘Other groups of sailors wanted to do well too, and started copying them,’ he said. It took about two years to steer enough sailors towards a common, systematic regime. Mr Sanders stressed the need for a sport to have a critical mass of participants, calling it the Pyramid versus the Eiffel Tower – one produces a constant flow of talent, the other does not. An Eiffel-Towered frame, hollow at the base and mostly thin the rest of the way up, will produce talent only sporadically, with success depending on just a few at the top. With a pyramidal scheme, the talent on the top rests on a broad shoulder of sailors, trained and tracked at each level by transparent selection and intense competition. ‘A large population doesn’t really matter, critical mass does,’ he said, explaining why sailing in Singapore does not need foreign talent. The association calculated that a talent base of 1,000 active sailors could produce about 100 national sailors, 20 of whom could form a pool of medal winners for each category of Asian Games calibre and beyond. The scheme passed a crucial test last December when Singapore’s sailors vaulted to the top of the Asian Games standings with five gold medals, beating stronger and larger countries such as China, Japan and South Korea. By Mr Sanders’ reckoning, the talent pipeline is not yet world class. ‘At the moment, we’re at the level of Asia’s best,’ he said. To achieve consistent Olympic standards, Singapore should be like Britain and Australia, which have about 5,000 sailors at the base of their talent pyramids. That would produce about 100 sailors at the apex for each category. I am all for supporting local talent, in fact I believe that it is the right thing to do and I would be deeply disgusted if 10 years from now I still see foreigners representing us (regardless if they make it to the podium or not because they would not know how to sing the National Anthem anyway). For now, having some foreign talent in National Squads is beneficial because the development is just in its early stages. One point that irks me though is that our potential world champions may not be as loyal to Singapore even, not to mention our foreign talents! From the bowling fraternity, we have Miss Teo and Miss Kwang, who after striking gold at the Asian Games and pocketing obscene cash rewards, quit the sport. Miss Teo is studying medicine in the NUS while Miss Kwang is attending University in Australia. Their sporting lifespan was not even halfway expired! Especially so in bowling, as seen with the current World Champion, Walter Ray Williams Jr., aged 50. My last point I would like to make is regarding NMP Phua’s statements. I respect the fact that the Bowling Squad, for the first time in years are trained and led by local coaches. What she did not reveal was that the SBF(Singapore Bowling Federation) is paying tens of thousands of dollars to a foreigner named Sid Allen for (not sure the exact appointment) consultancy and as an advisor and also coach training. His feedback also carries a lot of weight I believe. He may not be “blue-eyed blond” but he is definitely (another) caucasian. So is it really true that SBF is all “local”?